If trips to New York, Paris, London and Leningrad aren’t in your culture-loving budget, Google is providing a more economical alternative. Art Project, which just went live on the web, features extensive virtual tours of 17 major museums around the world, all at no charge. 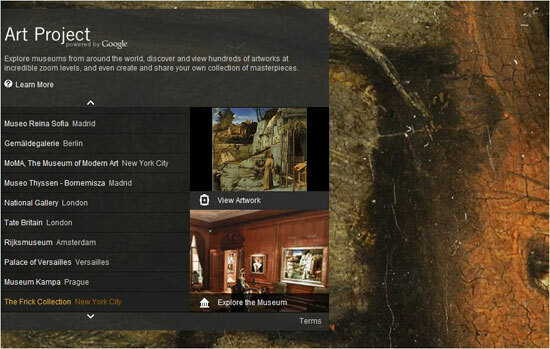 You have two ways to explore the Art Project collections. The more technically gee-whiz strategy is to “walk” the galleries, using the same virtual presence system Google employs for Google Maps’ street-level view. This is at least briefly interesting, and it does give you a sense of the collection as a whole. There is certainly a dramatic difference between wandering the vast galleries of the Hermitage palace in St. Petersburg and the intimate Frick collection, housed in a converted mansion in New York City. Only a small number of the works of art you pass are approachable in any detail, though, or even identifiable, making the experience a bit frustrating. More ordinary, but probably more practical, is the Art Project's drop-down menu system. Select a museum, then a work of art you’d like to see. You’re taken to a nicely organized view with the artwork on the left and information about it on the right. Each museum was allowed to decide what types of media to provide, so you never know precisely what you’ll find. My own favorites are the spoken commentaries, with experts guiding you through an exploration of the artwork. There are also some YouTube videos, and text information as you’d expect, but these take you away from viewing the image. Where the art appreciation experience has really been Google-fied is the megazoom system that allows you to magnify a high-res image and scroll around as you please, discovering details you’d never notice from the distance a museum guard would allow. In fact, some of the paintings have been scanned at 7 billion pixel resolution. Granted, that might be more appropriate to appreciating an amoeba than a painting, but it does reveal the artist’s brushwork in all its detail. At this initial stage, Google’s Art Project is a mixed bag. The pieces selected for inclusion (about a thousand all told) are sometimes Greatest Hits, sometimes far lesser-known works. In many cases, several paintings by the same artist are presented, offering an interesting opportunity (if it’s actually an artist of interest). I’d love to see the accompanying audio and video information beefed up over time, since those currently included are very successful in enriching the experience. All told, the Art Project is off to a good start, and Google deserves high praise for undertaking it. There are no annoying ads to be seen, so conspiracy theorists will be hard-pressed to bash the effort.